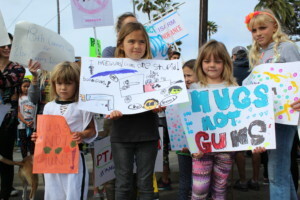 ENCINITAS — Around the country, people of all ages are fed up with gun violence. 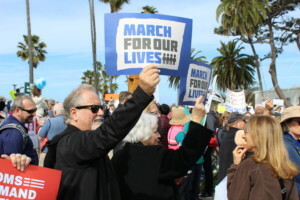 More than a thousand North County residents, including students, families, teachers and veterans, gathered on the lawn of the entrance to Swami’s State Beach in Encinitas to participate in a nationwide “March for our Lives” campaign. The rally, which took place nearly a week after a national school walkout, was just one of 800 gatherings that took place across the country to honor the victims of gun violence and advocate for stricter gun control measures. The coordinated event was also one of three planned marches in San Diego County, with thousands congregating at Escondido City Hall and Waterfront Park in downtown San Diego. Organizers and participants are appealing to local, state and federal politicians to work together to find a solution to gun violence in the aftermath of the Feb. 14 mass shooting at Marjory Stoneman Douglas High School in Parkland, Fla., in which 17 people were killed. An estimated 1,500 people attended the Swami’s rally, with potentially thousands more joining in for the march. 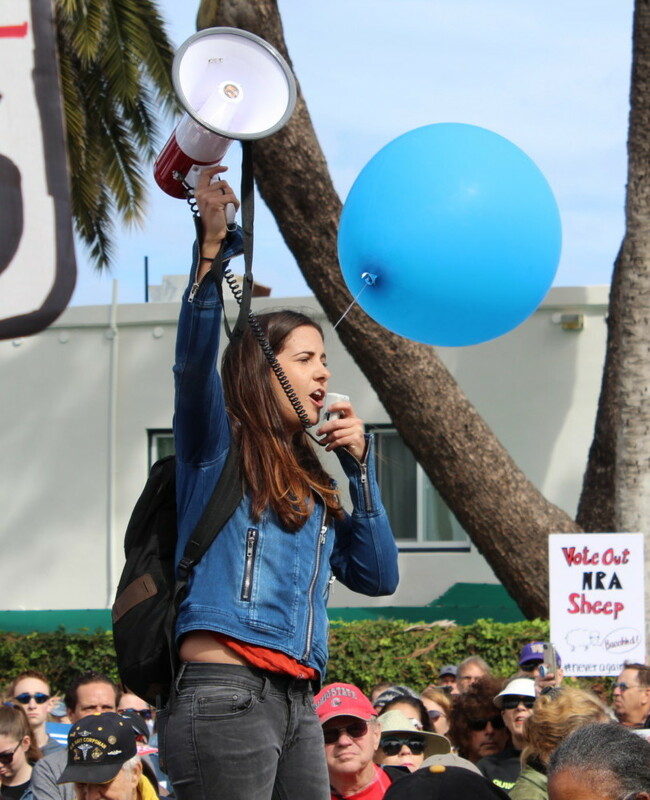 Rising above the noise of buzzing drones and honking cars, lead organizer and Carlsbad resident, Caroline Mayou, 26, read the names of the Parkland victims aloud through a bullhorn and led the group in a moment of silence before the crowd began its walk alongside South Coast Highway 101 to Moonlight Beach. Mayou said several factors motivated her to organize the North County rally. Mayou called the rally and march a success. “I was pretty excited that no trash was left behind, traffic was relatively undisrupted, and police didn’t have to interject,” Mayou said. Valley Middle School seventh grader, Kaia Ross, 12, of Carlsbad, came to stand alongside her classmates and friends to support the growing movement. “I’m here today for all the people who lost their lives at school and to help protect others,” Ross said. Mike Fidler, 71, of Carlsbad, holding a blue “March For Our Lives” sign, said with regards to gun control, it’s time for a change. Fox said he hasn’t seen such a massive public response and collective outrage since the protests surrounding the Vietnam War. “This is a peaceful movement that’s just in its beginning stages,” Fox said. Mayou said that the effectiveness of March’s rallies and student walkouts will be seen in November, when many of the students who were involved with them will go to the polls for the first time. “I think when we talk about impact, we have to look at it as direct or indirect,” Mayou said. “A lot of kids who did the walkouts or marched are not yet eligible to vote, or are eligible to vote for the first time. In school they are learning a watered down version of how government works, and they aren’t really aware of how politics work and how laws are created and the importance of taking their opinion to the polls. “What happens at the rallies is that it gets them registered to vote and educates them about candidates walking side by side with them, so that come November, they are ready to go, and that is when the real impact happens,” Mayou said.